To understand Anatomy Trains you must first understand Fascia. Fascia is the connective, web-like tissue under the skin. It covers the entire body like a spider man suit, encases the muscles, organs, muscle fibers, nerves and bones. 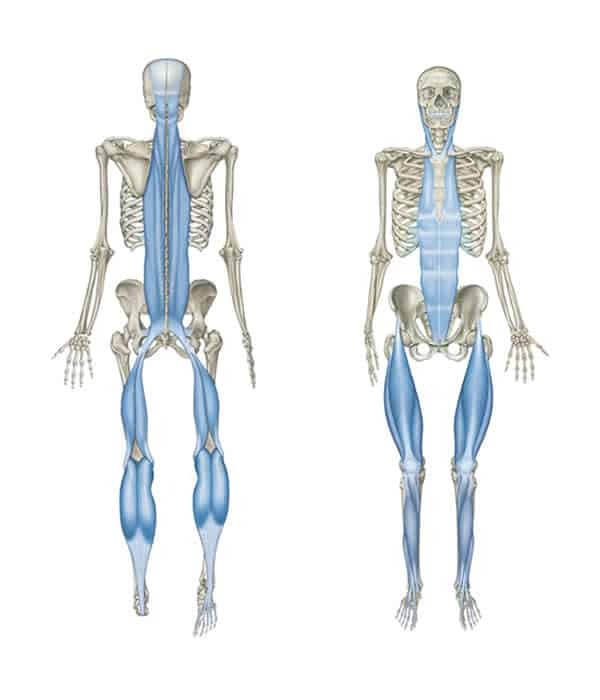 Myofascia relates to the fascia surrounding and separating muscle tissue (muscle – fascia). Specifically, there are twelve myofascia lines (meridians) in the body. These lines all run head to toe (or toe to head depending on how you look at it). A single line starts at a bone and connects through fascial webbing to a muscle, on to another bone and another muscle consecutively until it reaches its end. Anatomy Trains (as developed by Thomas Myers) is a symbolic way of explaining the twelve myofascia meridians (lines) within the body as a train system. This train system uses terms such as tracks, stations, roundhouses, switches…etc to represent each part of the lines. For simplicity, the “tracks” represent muscles and the “stations” represent bones. Anatomy Trains shows how the connective tissue moves the muscle which then moves the bone. It dispels the standard belief that the muscle alone (through contraction) moves the bone. The fascia was falsely considered nothing more than human packaging. (Most often it was cut off and discarded to see the muscles) The Anatomy Trains are lines of distribution, information, load, sensory feedback and communication within the body. Does Muscle Soreness Define a Good Workout? Pilates Consumers: Why Performance Pilates? Offer available to new clients only. Not to be combined with any other offer. Valid for new customer only. Limit one per customer. It cannot be combined with any other offer.